What is Data Analysis? Collecting data, reviewing the data, and making inferences from the data is data analysis. Analyzing data is important in continuous improvement. Data allows you to make sound decisions about the process, product or service. What is Data analysis? It is a scientific approach to improvement. Simple data analysis comes down to two terms. I talk about these two terms on this page. Data comes from everywhere. There is process data, product data, financial data, mechanical data, electrical data, and service data. Every organization improves with their own set of data. If you can’t measure it, you can’t improve it. The best thing about data is that most data follows the same patterns. Simple statistics can be used to analyze the data. The term statistics seems to scare people. But really, it is quite simple and data analysis in excel is easy. Let’s start with the types of data. There are two types of data. To answer the question - What is data analysis? You have to understand the difference between these two types of data. Variable data comes from a measurement. This is an actual number. Examples of the measurement include test scores, weight, length, width, thickness, sales dollars, profit, cycle time, pH, plating thickness, tensile strength, tension, diameter etc. Cad drawings will have many measurements. Financial data includes purchasing costs, sales volume, profits, sales growth etc. Attribute data is go / no go, yes / no or good / bad. Attribute data tracks conformance vs nonconformance. It is used when classifying defects. For example, a manufacture that makes glassware may classify defects as broken glass, thin glass, scratches, misshaped, etc. The result of a variable data measurement could be an attribute. Lets say your measuring the glass thickness and the glass measures below the specification for thickness. You call this defective glass as thin glass. You reject the glass for thin glass. Thin glass is an attribute. Suppose you measure 100 glasses for thickness and 10 of them were thin class. Then the attribute data for the 100 glasses are 90 are good and 10 are defective for thin glass. The first step of data analysis is to collect the data. Below is a table of the length of a 2 foot speaker. I went out and measured 100 units of a total of 1000 speakers. The unit is in inches. What is data analysis or what can we infer from this data? Well, there are many points in the 21 and 22 inches. That is about it. To make more sense of the data we need to sort it. The below table sorts the data from low to high. The first statistical term that we can easily calculate is the range. The most common average used is the mean. Median is the number that is in the center of the data set. There is 2 numbers in the center of this data set. Both are 22, the median is 22. What is Data Analysis? We can take the data and make a histogram. A histogram is visual representation of the data. The Y axis is the frequency that the number occurs. The X axis is the measurement cells. Most of the data is centered about 22. The mean is 21.9955, The mode is 22 and the median is 22. All average data points are 22. 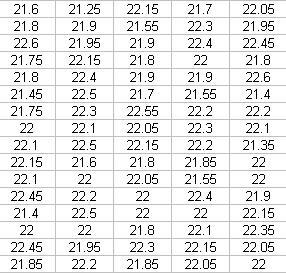 The data is centered about 22. 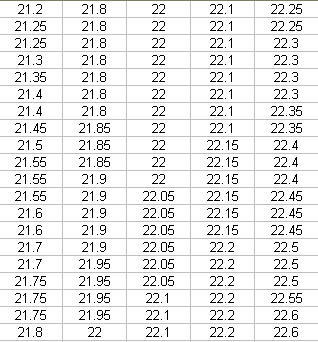 The further away the measurement is away from 22, the less frequent the data appears. What is data analysis? Data analysis include creating a picture of the data. This picture is called a frequency diagram or a histogram. There is a curve driven on the data set. This curve is called a bell shape curve because it looks like a musical bell instrument. When the data has a bell shape curve we call this normal distribution. When we have normal distribution we can calculate the standard deviation of the sample. Standard deviation measures the spread of the data about the mean. It tells us the width of the bell shape curve. You can find more on normal distribution here. Step 1: Take each number and subtract it from the mean. Square the results. Then sum each of those. (21.2 – 22)2 + (21.8-22)2 + (22-22)2+…. Step 3: take the square root of step 2. This is a difficult calculation but Microsoft excel can do it easily. The two terms - What is data analysis? What is data analysis? We now have 2 statistics that describes our data set. The first is the mean and the other is standard deviation. The mean tells us the center of our data. The standard deviation tells us the spread of the data. Mean and standard deviation are the most common terms when it comes to data analysis. Understanding these two terms and normal distribution are basic tools for process improvement. This allows us to apply many other tools to making improvement. Here are more examples of histograms.